Last night’s Fringe was all about the resurrecting of the dead, but the episode’s greatest Lazarus act had to do with including scenes featuring already-killed-off character Agent Francis. Is he back? Nope: Fox and the show’s producers decided to pawn off an old, never-aired episode as a new one. That would have been perhaps forgivable if the story line had been worthy — instead, it was the lamest in recent memory. The Evil: Lisa, a teenage girl who recently inexplicably slipped into a coma, is taken off life support and pronounced dead — only to suddenly return to life and start speaking in Russian, though she didn’t know the language before. The Determination: The spirit of a newly dead naval officer has infiltrated the girl. Because he suffered from radiation sickness, Lisa has contracted his illness, which explains her feeble health. Walter concludes that the radiation allowed the officer to transport his soul into Lisa’s body at the moment of her death, in effect “jump-starting” her system and bringing her back to life. Paranoia Level: Critically Low. In retrospect, naming last night’s episode “Unearthed” was a little too perfect. Though ostensibly a reference to the uncovering of the naval officer’s soul within Lisa, it also could have been a nod to the fact that the producers were digging out an old episode — one filmed during the time before Agent Francis was killed by the shape-shifters and replaced with an evil clone — and masquerading as if it’s a new installment in the program. But like a lot of “lost” recordings, the episode wasn’t a buried gem but, rather, a stinker that should have remained safely out of public view. To this point, season two has been a steady, sensitive exploration of the Walter-Peter relationship while offering some intriguing developments into the show’s overall mythology. But “Unearthed” featured none of that, instead reminding us that when Dunham is the narrative’s central character — as she was last night, wrestling with her lapsed faith — it’s a terrible bore. Plus, one wonders if Alice Kremelberg, the young actress who played Lisa, was secretly hoping that “Unearthed” would never air since she, embarrassingly, has to spend the last third of the story speaking in a goofy “masculine” voice to indicate that the naval officer was in possession of her body. Sometimes when you watch a show from week to week, you can miss the gradual improvements that happen slowly over time. 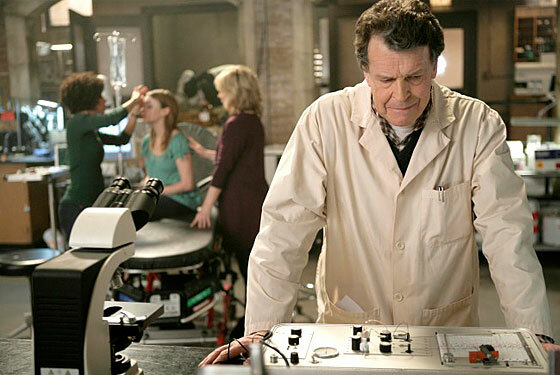 So maybe at least in that way “Unearthed” could be looked at as instructive: Fringe may not be perfect, but it’s sure a hell of a lot of better now than it was when they made this episode. MTV’s Josh Wigler points out that “Unearthed” was at least a mini-Oz reunion, bringing together four cast members from that show. TV Squad’s Jane Boursaw unconvincingly defends Kremelberg’s performance.